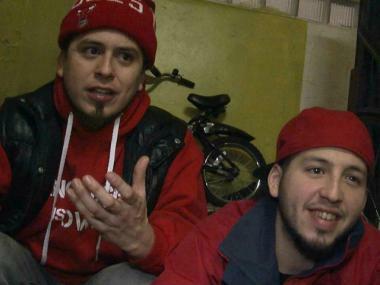 Rodrigo (l) and Gonzalo Venegas (r), members of rap group, Rebel Diaz, and founders of the Rebel Dias Arts Collective in the South Bronx. MOTT HAVEN — When brothers Rodrigo and Gonzalo Venegas first spotted the old candy factory on Austin Place in 2008, it sat silent and deserted amid a row of industrial buildings near the Bruckner Expressway. On Friday, three years after the pair enlisted a small army of volunteers to overhaul the space, the former factory rocked to life as rappers from as far away as New Jersey came to awe the audience with their rhymes. “It’s really fulfilling the mission of the space," says Rodrigo. "We’re building with hip hop and using it to its fullest potential." Several dozen budding emcees and their admirers turned out Friday for the open mic night, called Boogie Mics, a monthly gathering that the brothers launched in 2011. The event is one of several hip hop-inflected, community-minded programs that the pair and their 20-member arts group, the Rebel Diaz Arts Collective, host in the converted loft space. 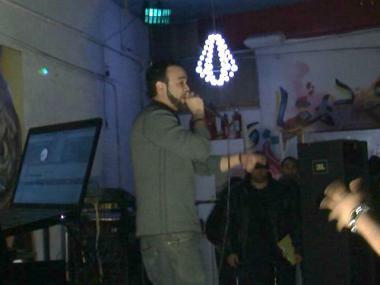 The Jersey-based emcee performs at Boogie Mic, an open mic night at the Rebel Diaz Arts Collective, a South Bronx hip-hop community center. 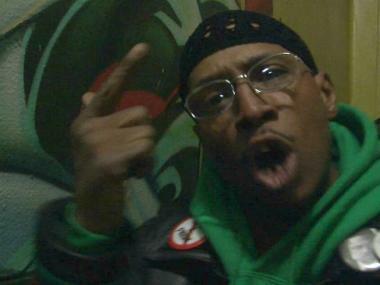 After the Venegas brothers, who are members of the activist rap outfit Rebel Diaz, first discovered the factory with some friends, they began to squat in it. A few months later the pair signed a lease with the owner. Then they recruited local artists and craftsman who collected donations and recycled materials, which they used to renovate the 4,000-square-foot space. “This is a place that’s built by the 'hood, for the 'hood,” says Rodrigo, whose hip-hop handle is Rodstarz. Today, a stage and audience area, a recording studio and a computer lab fill the space, and its walls are covered in graffiti murals and paintings. The collective hosts film screenings and discussions and offers media workshops for teenagers on photography, video editing and music recording. The collective’s members meet every Monday. Boogie Mics runs from 8 to 11 p.m. on the first Friday of every month. Admission costs $7, which also buys performers a chance to try two songs on stage, where the house DJ will spin beats that the rappers provide. No alcohol is served and all ages are welcome — a point the Venegas brothers emphasize. “We are here to provide a space and infrastructure where young people can practice an alternative culture,” says Gonzalo, adding its one focused on “building our community, not destroying” it. A mix of fledgling and veteran rappers that included Marz, Poet 360, Chief69 and Silent Knight took to the stage Friday night. Their rhymes contained some of the standard hip-hop bravado, but many also alluded to everyday hardships such as steep rent, deep debt and street violence. “It’s really important for people and communities to get together and share ideas and feel empowered,” says Jersey-based Silent Knight, who rapped Friday about the dearth of healthy food and affordable housing in poor communities. His most recent album is “Busy Is My Best Friend," with the label Elementality Productions. Spoken word poet, Poet 360, recites some rhymes at the Boogie Mics open mic night in the South Bronx. Throughout the night, many rappers noted the South Bronx’s distinction as the birthplace of hip hop. “The history is here and present, and the young people are keeping it fresh,” says Gonzalo, whose rap name is G1. “Hip hop is alive and well."